ISE 2015: Tannoy addresses its 90th birthday | What Hi-Fi? It wouldn't be hyperbolic to suggest that Tannoy is synonymous with sound. Few tech brands have the linguistic momentum to make it into the dictionary. Then again, few tech brands get to celebrate a 90th birthday – something that Tannoy will be doing next year. Here at ISE 2015, the company’s heritage demands acknowledgement. Their display neatly condenses an evolution since 1926, from public address system to hi-fi. It is impossible to drift past with a cursory glance – not when you are confronted by a behemoth and its heavyset siblings. These are the speakers of the Prestige Gold Reference range: Turnberry, Kensington, Canterbury and Westminster Royal. Their retro styling and impressive size evoke the Tannoy of old: sound first, all else be damned. Big boxes with big drivers, basically. Back in the ‘60s and ‘70s, heft was not an issue. Tannoy attracted a huge following in the studio market before turning its attention towards consumers. 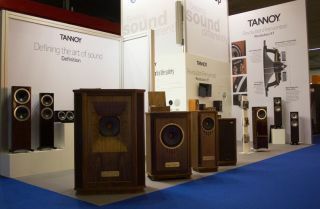 "In the 1980s, it was all about the sound quality," explains Tim Lount, Tannoy’s vice president of sales and marketing. "We didn’t make anything below a 10-inch driver. That’s the way it was done." A few metres from these attention-grabbers, the situation looks entirely different. "By the time we hit the 90s, we were catering for a more consumer-led, design-conscious market," Lount offers. Tannoy’s latest output is relatively compact. There are clean lines and nothing approaching an Art Deco vibe. This is the XT, the latest iteration of the Revolution series. The disparity between retro and new is not as big as it may appear. Tannoy’s focus remains fixed on its Dual Concentric driver from the 1947, which offers a tweeter set deep inside the centre of a woofer for time alignment. Its latest modification involves moving the tweeter forward to improve dispersion, but Lount explains this is nothing new. Dispersion has been tweaked since the beginning of the Dual Concentric. "It was a selfish listening experience. The high frequency was set so far back it was in effect coming down a tunnel. Dispersion was very weak." So what next? Nearing its 90th anniversary, Tannoy appears entirely at ease. There is no identity crisis, and no wild plans to redefine or rebrand. The company is sticking to its two-channel strengths. Lount hints at potentially supporting the Prestige range with a modern-styled range, retaining the benefits of large cabinets while adding a more contemporary vibe. But don’t rule out wireless tricks yet. Tannoy is open to new trends, and it is aware of high-tech consumer requirements. "We will continue to develop real, two-channel hi-fi, but with our eye on the consumer desire for easier source material, such as Bluetooth or streaming," says Lount. "That’s on the cards for development, but there is no timescale on that. When it happens, it will happen in the context of us breathing some Tannoy-ness into it." Proud, confident and down with the kids: now that’s how you approach your 90th birthday.